﻿﻿With the success of Magic Man as a single release 1975 on the Montreal radio airwaves, Heart moved from playing at clubs and bars to performing at shows with Rod Stewart, Aerosmith, Ted Nugent, Journey and Van Halen. Dreamboat Annie was initially released for Canada only, selling 30,000 copies in just a few months as airplay increased on Canadian airwaves. The album was then released in America with a focus on Seattle and it quickly sold another 25,000 copies. Not having national distribution, a plan was in set motion to promote the album city by city. Despite the success to both the band and their record label Mushroom, the relationship fell apart and lead to Heart signing with Capitol. With Heart rising on the rock scene, Mushroom executives refused to rework the band's contract and the royalty rates. The dispute reached toxic levels, when without consulting the band, Mushroom bought a full page tabloid mock ad in Rolling Stone magazine which gave the insinuations that the band was at best a one hit wonder and that sisters Ann and Nancy Wilson were lesbian lovers. This would be the motivation for the hit song Barracuda. 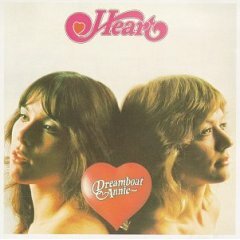 Dreamboat Annie reach platinum before the end 1976 hit and broke out on sales charts in five countries. Crazy on You, Magic Man and Dreamboat Annie were the only singles from the album and had varying degrees of success. When it comes to rock, it's hard not to include Heart in the conversation. Not only was Heart an icon amongst rock music of the late 70's and early 80's but was also a spark in a revolution of women in rock. Ann and Nancy also went on to play a part in the music scene of Seattle by working with bands such as Alice in Chains, Pearl Jam, Soundgarden and R.E.M. through their Bad Animals recording studios. Compared to their counterparts and contemporaries of the late 70's up through today, I would put Heart up against anybody. Individually speaking, Ann can belt out lyrics which easily rival that of Elizabeth Hale and Nancy's guitar work should never be dismissed. Nancy Wilson is ranked as one of the greatest female guitar players of all time and I argue that she can hold her own against any other guitarist you throw at her. The proof is the music.